Contemporary British Silversmiths were delighted to take part in this year’s London Design Festival at the V&A. Alongside our Silver Speaks: ‘Idea to Object’ display in the Silver Galleries at the V&A, acclaimed silversmith Rebecca de Quin spent the day in the Galleries demonstrating her technique of quilting silver. We had an unprecedented interest and spent the day talking to over 240 visitors to the demonstration, showing that there is a keen interest in the skills of our highly trained silversmiths. 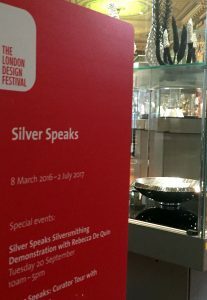 Visitors had an opportunity to view the Silver Speaks: ‘Idea to Object‘ display, curated for Contemporary British Silversmiths by design critic and journalist Corinne Julius who also gave a gallery talk to 53 visitors to the V&A Silver Galleries. Also on display was the latest commission for the Silver Trust, destined for Number 10 by Junko Mori. Silver Speaks is a year long programme of events created by Contemporary British Silversmiths to celebrate silver in contemporary life. The event continues until July 2017. To view the full programme click here. 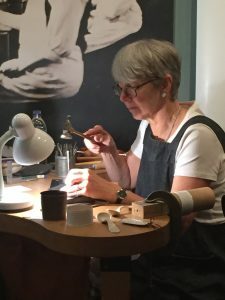 Members of Contemporary British Silversmiths also put on a talk entitled ‘The Silversmiths’ Toolbox’ at the Goldsmiths’ Centre and Vicki Ambery-Smith and Mary Ann Simmons gave a talk on silversmithing and architecture. 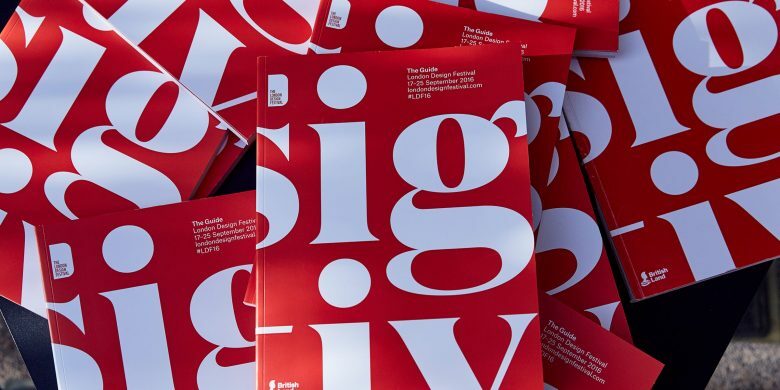 The London Design Festival is an annual event, held to celebrate and promote London as the design capital of the world and as the gateway to the international creative community. 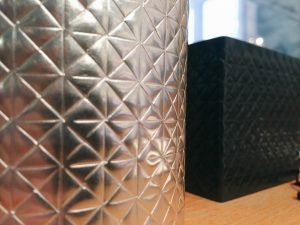 Silver Speaks, an exciting programme of events organised by Contemporary British Silversmiths, the leading association for design-based contemporary silver.